Beetle fry, anyone? A ‘Pest-aurant’ in the remote and rapidly-shrinking Majuli, world’s largest river island in northeast India, has cooked up a unique method to prevent pests from attacking crops in the region – eating them before they devour the crops. With insect farming creeping into discussions on sustainable food systems across the globe, there is an untapped potential of insect-eating for pest control that is now being explored in this region of Assam. The seemingly innocuous white grub beetle (Lepidiota mansueta) which feasts on potato, colocasia, green gram and a range of crops in Majuli in Assam is up for grabs in fried and roasted forms in the soon-to-inaugurated outlets of pest-restaurant ‘Pestaurant’ besides other pestilent but protein-rich insects such field crickets and mole crickets. The origin of the concept eatery lies in research that not only detected, reported and nutritionally-profiled the beetle endemic to Majuli but also mobilised indigenous communities to consider the pest as food. The research and extension activities were carried out as part of the All India Network Project on Soil Arthropods Pests (AINPSAP) funded by the Indian Council of Agricultural Research, New Delhi. “We will officially launch the outlets in April this year (2019) in Majuli. We are trying to link up tourism to entomophagy and showcase how insect-eating can be sustainable and help deal with pests,” Badal Bhattacharyya of Assam Agricultural University and principal investigator of the project told Mongabay-India. The multiple award-winning concept was recently honoured with the HK Jain — Central Agricultural University(CAU) Award for Excellence in Agricultural Research for Bhattacharyya. The island with a population of over 1,60,000 has a crop area spreading across 300 sqkm. Up to 35 to 40 percent of this is attacked by this pest. Grubs of L mansueta (locally called ‘hati-puk’) were first recognised in some sugarcane fields of Uttar Pradesh, India during 1960 as a root feeder. However, this species did not receive due attention because of its remote incidence and unpredictable occurrence. The light brown beetle is an unusual species of scarab beetles, in the sense that it transforms from an egg to an adult insect via the grub (larva) stage, in two years. This biennial beetle species is the first of its kind reported from northeast India, pointed out Sudhansu Bhagawati, an entomologist with the AINPSAP. “Local farmers knew about the presence of the beetle but till 2005 they were not ravaging crops in large numbers. We believe that climatic changes such as erratic rainfall and early onset of summer led to a drop in the arrival of their seasonal predators, the Sarus crane. This, in turn, pushed the beetles’ numbers up in the absence of predators,” said Bhagawati. Other factors that are believed to have contributed to its infestation are the conversion of sandbars (virgin low grasslands) into farm plots by flood and erosion-affected villagers, high organic content of the soil and abundant thatch zones in the endemic pockets on the island. Majuli is the nerve centre of Vaishnavite culture and is home to ethnic communities such as the Mishings, the Deoris, the Sonowal Kacharis, the Ahoms and the Nepali communities. The verdant green island landscape stretching for 80 km is a dollop of sand in the middle of the Brahmaputra river’s upper reaches in Assam. It was created by the river’s changing courses, events that were triggered by earthquakes and floods. Erosion has shrunk the island from 1,256 sqkm in 1891 to not more than 515 sqkm. As the scientists kickstarted their work on the beetle under the project, their studies threw up interesting nuggets of information that helped them devise methods to deal with the pest. It is the larval-stage, beetles and grubs buried beneath the earth which mostly spell trouble for the farmers. “The adults do not feed on plants. The grubs feed on roots and tubers beneath the ground while they mature. So the species has the unique distinction of being the first Indian plant-eating white grub species with non-feeding adults,” Bhattacharyya, the principal investigator of the project said. The grubs are resilient: they thrive well in wet soil conditions of the riverine island and can withstand prolonged submergence/flood. The beetle can be regarded as a rare species because it spends its entire life cycle under the ground except for a short period during which adults emerge from the ground for mating, which is why the use of insecticides does not offer a way out. They make an appearance during dusk (6 pm to 9 pm) for about two to three weeks during pre-monsoon season. The team took advantage of this unusual emergence behaviour of beetles. Instead of hunting for the grubs, if they could eradicate the adult beetles when they emerged then they could nip the problem in the bud. “Since it is very difficult to search for them, we thought of scouting for them and trapping them by luring with solar LED lights and other light traps as part of a large community mobilisation programme. Our research showed us the insects were attracted to lights,” said Snigdha Bhattacharjee, a junior research fellow with the project. So in 2012 mass training campaigns began in a social engineering drive and as many as 400 farmers in groups of 10 were coached to collect and destroy the insects. In 2018, the project created a record of “Most Beetles collected in 3 hours” by trapping 73,700 specimens of white grub beetle, in collaboration with 100 farmers of Majuli at Maharichuk village. “The management approach is eco-friendly and cost-effective since, without applying a single drop of insecticide, the beetles were caught and killed. This chemical-free method was important because Majuli by default is organic,” observed Peter Shyam a junior research fellow associated with the project. Bhattacharyya highlighted that this endeavour will lead to a huge economic benefit to the tune of approximately Rs. 30 million (Rs. 3 crores) to the farmers of 10 white grub-endemic villages around the site of execution during 2018-19. From 2010 to April 2018, a total of 900,000 beetles have been collected, informed E. Bidyarani, a junior research fellow associated with the project. 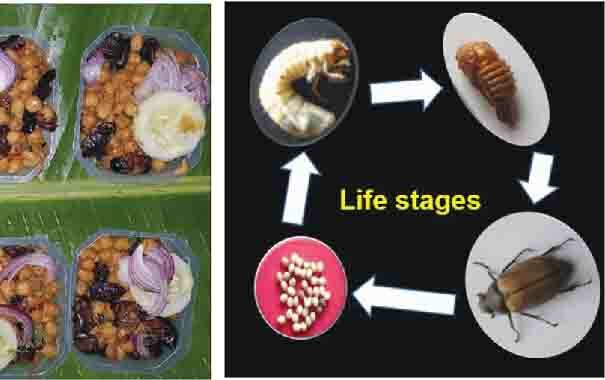 Local tribal people relished the cooked or fried adult beetles as protein-rich food, opened up a new avenue for research on its nutritive and nutraceutical value. Researchers found the adult beetle had 76.83 percent protein content, 10.93 percent carbohydrate content, 5.15 percent fibre and 4.10 percent fat and is also completely free of toxins. “Processing, refinement and value addition to roasted and fried beetles not only became popular among the ethnic tribes but also among the other communities of Majuli. Initially, many local community members were hesitant to consume the beetle but we demonstrated by cooking the beetle with basic ingredients as to how easy it was to whip up a tasty dish,” said Khanin Pathak a junior scientist (biochemistry) associated with the project. Roasted beetle fry with tomato, plainly roasted beetle and beetle curry soon became a hit not only among locals but also with tourists leading to the formation of a small eatery backed by AAU in Kuli-Chapori village. “Those who did not want to consume the beetles can use them as feed for pigs and poultry,” Bhattacharyya said. Bhattacharyya assures the initiative is sustainable. “We can’t kill all the beetles. A significant percentage will thrive and will regenerate so the concept will be sustainable. The outlets will stay open only during the time the beetles emerge and are available for trapping,” added Bhattacharyya.